When I describe Workstream Messaging I inevitably make a reference to Slack. That’s about to change as most of the world is about to discover the concept from Microsoft with its newest offer: Microsoft Teams. There was a rumor sometime ago that Microsoft might acquire Slack, but Gates said no. The story goes that Gates felt that Microsoft should build it. I have no idea if this is true, but it certainly sounds plausible. It makes perfect sense that Microsoft would examine Slack as it holds the crown for fastest growing enterprise software company. Slack is hardly alone in what it provides and wasn’t even first, but it’s the breakout example of Workstream Messaging for business productivity. I will come back to build vs. buy below. “Workstream Messaging” captures two important characteristics of this new breed of application, but of course there’s more. “Workstream” captures that these tools are not another single-purpose app (like UC apps) that get used for specific needs. Workstream describes the fact these apps become portals to the daily workflow. This is possible because they contain so much information. Specifically – people (directories), content (documents and other information provided by any number of applications), and communications (asynchronous and real-time). “Messaging” conveys the primary means of interaction which also happens to be the preferred means these days. It’s less intrusive than calling and more urgent than email. Although these apps support multiple communication modalities, they are anchored in messaging. Groups or Team support. IM is generally 1:1 (many support groups). Teams are critical, and users can be involved in multiple teams. Inter-organizational: Not the same as federation – but workstream solutions allow teams to be comprised of people that may not all work at the same company. Self Organizing: eMail tends to be an inefficient LIFO system – workstream solutions effectively file interactions into the right container – automagically. Search: All this stored content becomes valuable, even more so if you can find it. APIs and Integrations: The portal or dashboard concept means that data from other applications needs to find its way into these systems. Read Receipt/Presence: Communications is so much better when there’s a heartbeat on the other end. Task Management: Some systems also attempt to track tasks – a natural outcome from meetings. Now back to build vs buy. Microsoft could have bought Slack (or any of the other 30 companies in this space), but opted to build its own. I can respect that logic because the concepts of messaging, persistence, and search are well established and not hard (for Microsoft) to create. The harder part for Microsoft would be deep integration – with Office, Outlook/Exchange, OneDrive, and more. That’s what Microsoft has done with Teams. Teams appears to be built from scratch – you can kind of tell because it’s so incomplete (not GA yet). 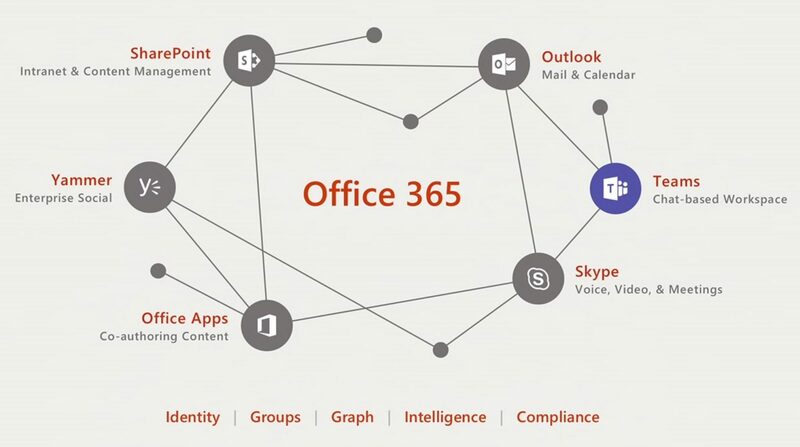 It also appears to be key to a broader vision for O365. Note: the launch last week featured CEO Satya Nadella himself in person. The vision is big – so big that Teams overlaps with several existing Microsoft solutions including SfB, Yammer, and Outlook. And that’s going to make for some interesting drama. A lot of that overlap is with SfB. Teams supports voice and video (1:1 and group) interactions. Outlook meetings are automatically loaded in Teams for one-click join. Teams also provides instant messaging (chat) and presence information. The overlap is significant, but not complete. On the other hand, Teams is in preview and SfB is over a decade old. Teams was built for the cloud and SfB was built (originally) for onsite installations. Is it out with the old and in with the new? 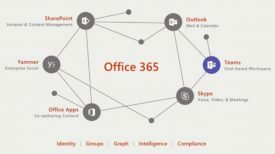 Microsoft Teams also overlaps with numerous competitive and workstream solutions – more every week lately. 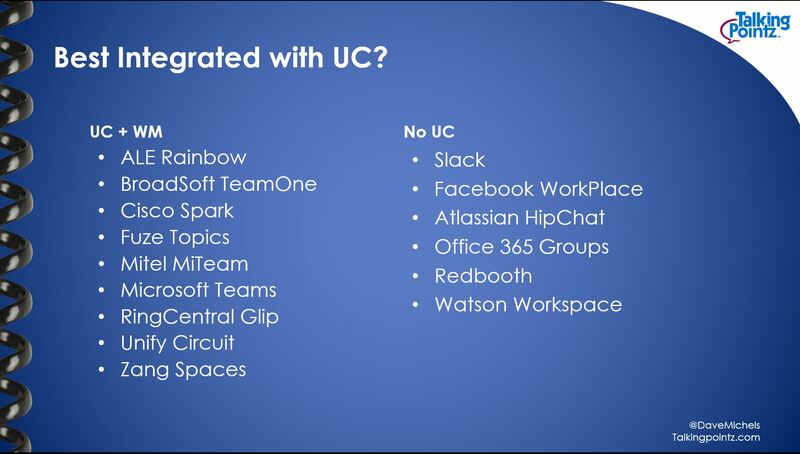 In addition to the standalone apps such as Slack and HipChat, there’s also the UC related solutions such as Cisco Spark, Unify Circuit, and Mitel MiTeam. Personally, the UC angle makes tremendous sense to me as these tools are meant to include it all – and fragmenting out PSTN voice, endpoints, and contact center weakens their value. Teams is brand new last week, but in the past month there’s been two other big workstream announcements: Workplace by Facebook and IBM’s Watson Workspace. Are there too many? Probably, but it is hard to say: No one really complained when every single UC company and social site had its own solution for IM. The quantity of these solutions are not as big a problem as several other concerns they introduce. The big two being data ownership and federation. Those are the topics to watch as these solutions gain popularity and mature. If you would like to learn more about Microsoft Teams, download this free 2Pager.